Dreams start with a vision and that’s exactly how Hudson Ale Works came to life. Birthed from a simple garage, this 10-gallon home brew system quickly gained popularity within the local community. It was only four years ago that Josh Zimmerman, along with Neil and Adam Trapani, turned their mutual love for beer into a passionate and fruitful venture. Keeping up with the high demand, the trio started brainstorming ways to take their dream to the next level. Knowing location is the first—and often most important—step, they set off to explore their options. It didn’t take long to find the ideal home for their brewery. Nestled in Highland, NY—hometown to all three of these guys—they discovered a dilapidated building in the hamlet. Absolutely perfect, this location combines an intriguing blend of industrial life with a trendy low-key vibe. Surrounded by everything from local farmhouses to plenty of vintage architecture, this forgotten building held a lot of potential and the Hudson Ale Works guys took on the challenge with zeal. Together, they gutted and rehabbed the 7,500-square foot building into a beautiful home for their vision. In 2015, they were even recognized by the Town of Lloyd Economic Development Committee for their innovative reuse of the building. Leaning a little rustic, the modern interior is a stunning and comfortable reflection of Highland’s charm. 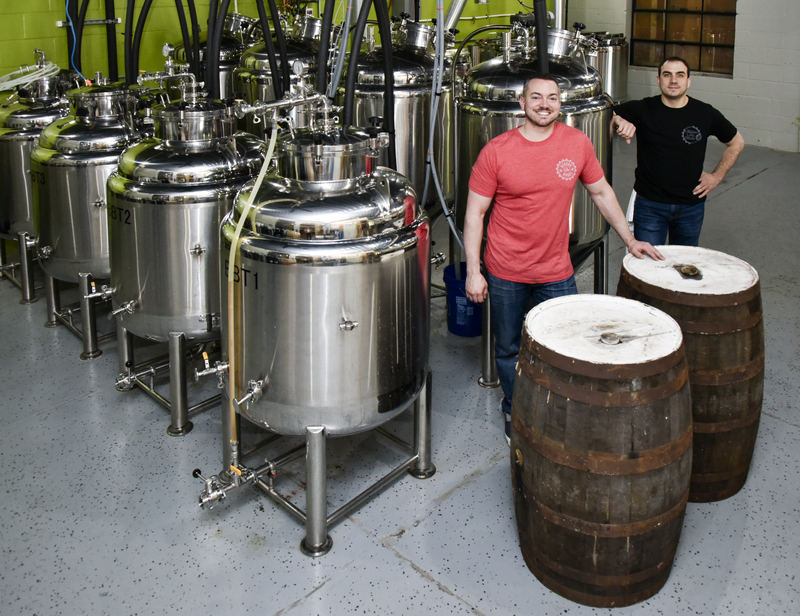 Once the building started to come together, they purchased their three-barrel brewing system and began formulating recipes. Everything was falling into place even better than they could’ve imagined and it only took a little over a year to finally open Hudson Ale Works to the public. Now, with eight rotating beers on tap, patrons are able to purchase full pints of beer, purchase 12oz cans togo, have their growlers filled, and satisfy ravenous—or light!—appetites with an enticing locally-sourced menu. Here at Hudson Ale Works, it always goes back to the original dream. A simple passionate adventure of three friends doing what they love. Beer enthusiasts themselves, they want to share their passion for a finely brewed beer with the community. It’s very much about bringing people together over a nice cold drink, but the owners also have a desire to bring more business to the hamlet of Highland while working with local famers. Whether it’s providing them with spent grain to feed their animals or purchasing various necessary items from local vendors, Hudson Ale Works has a desire to see the community thrive and grow right alongside them. A place where people can come together, feel good and leave their troubles at the door, Hudson Ale Works aims to connect with others while building the local Highland area into more than just an attraction for tourists perusing the nearby Hudson Valley Rail Trail and other popular sights. This brewery is truly a home away from home and after one visit it’s obvious that the guys behind this place are just as passionate as they were when they first began selling their well-crated beer from Neil’s garage. It’s clear, also, that this is only the beginning of a long lasting addition to Highland’s prospering community. But … you’ll have to stop in to see for yourself.